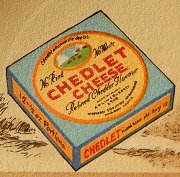 In 1888 James Shorland Aplin and William Henry Barrett merged their wholesale dairy businesses together for the purpose of creating and marketing cheese, cream and butter. In 1891 the Western Counties Creamery moved to Marston Magna from Rimpton and in 1898 it was amalgamated with Aplin and Barrett Ltd.
Around the turn of the century Aplin & Barrett acquired some two acres of land on the eastern side of Newton Road, near its junction with Middle Street, that had been the extensive grounds of Osborne House. The decision to purchase was undoubtedly enticed by the close proximity of Yeovil Town Railway Station and its associated goods yard at the heart of a potential national distribution system for their products. The aerial perspective sketch above, of 1898, shows the planned factory and office buildings which were constructed by the time of the 1901 Ordnance Survey. At left is Lower Middle Street and Newton Road runs across the bottom of the drawing. At extreme left were three existing houses occupied in 1891 by the families of a brewer's cellarman (clearly of the Osborne Brewery that the proposed site backed onto), a mason and a leather dresser. Featuring prominently in the sketch, at right, is the railway that prompted the positioning of the factory. The corner plot at the junction of Newton Road and Middle Street was, of course, to become the site of the Western Gazette offices but in 1901 their offices were on the opposite corner of Newton Road. It is clear, by comparing the sketch above with the Ordnance Survey map of 1901 below, that the factory was built pretty much as the sketch. 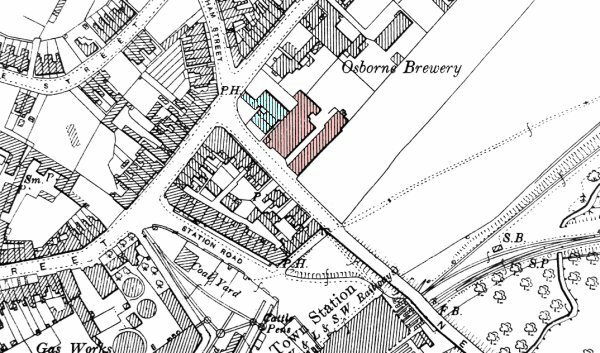 However the two blocks of buildings on the very corner, one looking like three cottages and the other appearing like a small factory building and shaded blue on the map below, were already existing while Aplin & Barrett contemplated their new factory because they appear on the 1886 Ordnance Survey. 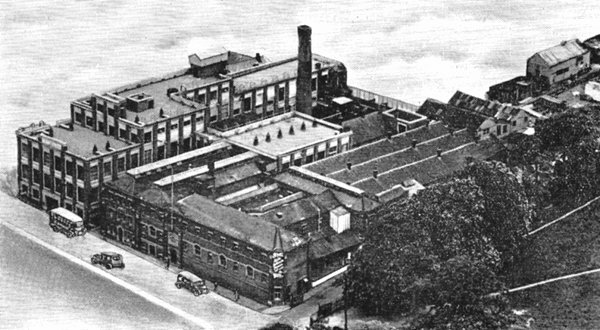 Whether or not these buildings were incorporated into the new factory, as suggested by the aerial sketch above, is not known. 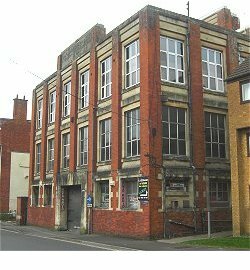 However they did not survive the decade since the Western Gazette offices were built at this location in 1906. By comparing the sketch above with the photograph of the 1912 fire below, it will be seen that the right-hand building in the sketch is the building at left in the photograph. This means that the field to the right of the building in the sketch had the building on the right in the photograph built on it by 1912. 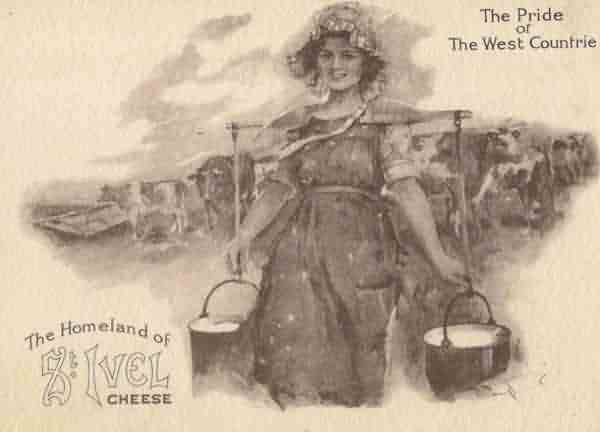 The St Ivel brand was born in 1901 and applied to a range of their products, even though there is no saint of that name. 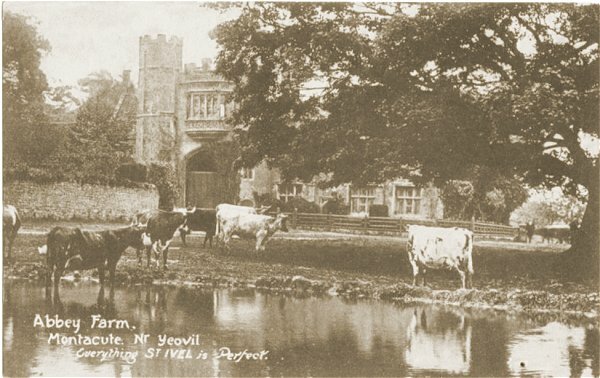 In fact Ivel was one of the spellings accorded to Yeovil by John Leland in his Itineraries of 1533-46. 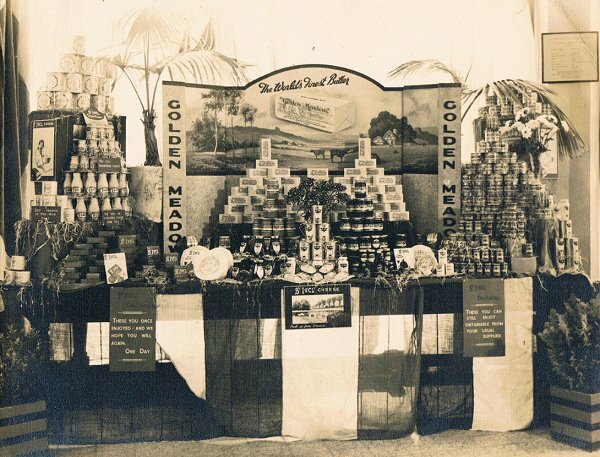 Nevertheless the brand became well established, nationally famous and included butters, creams and cheeses. 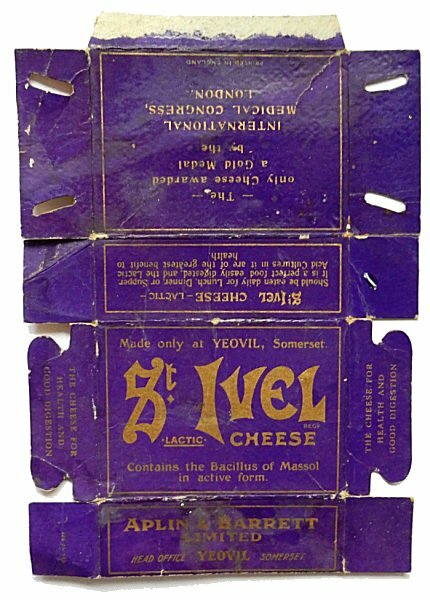 Their famous 'St Ivel Lactic Cheese' was introduced in 1909. 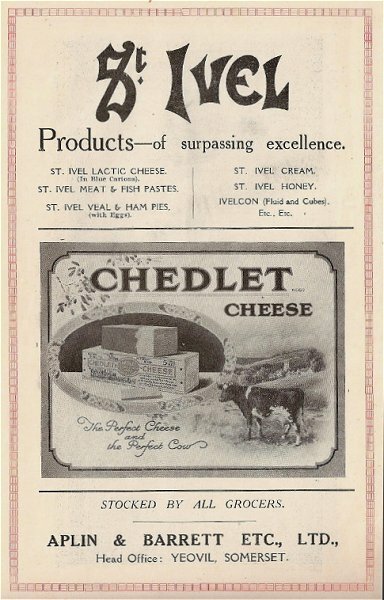 EED Marden’s cheese and milk company was absorbed into the Western Counties Creameries and, by similarly incorporating WT Maynard’s meat processing company, Aplin & Barrett also produced a limited range of meat products such as pork pies, sausages and potted pastes. 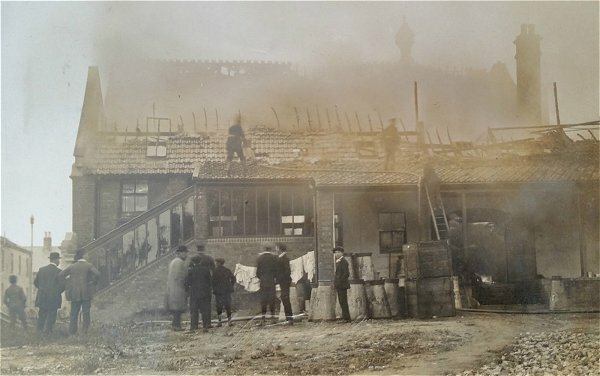 On 11 August 1912 a fire took hold in the factory but fortunately was contained within one wing containing most of the office accommodation and part of the creamery. 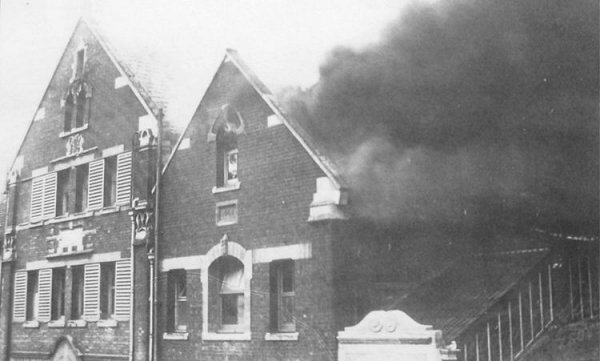 The fire was watched by a crowd of several hundred but eventually put out by the fire brigade with assistance from the Sherborne fire brigade and, apparently, two members of the London fire brigade who happened to be visiting Yeovil at the time. 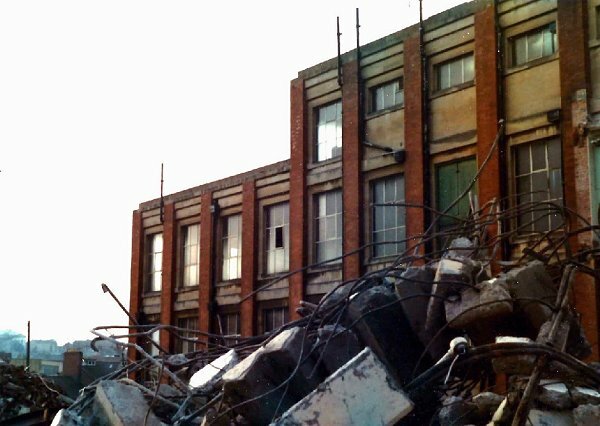 The Western Gazette reported “new and valuable machinery and a very large stock of a most inflammable character” were contained in the buildings. 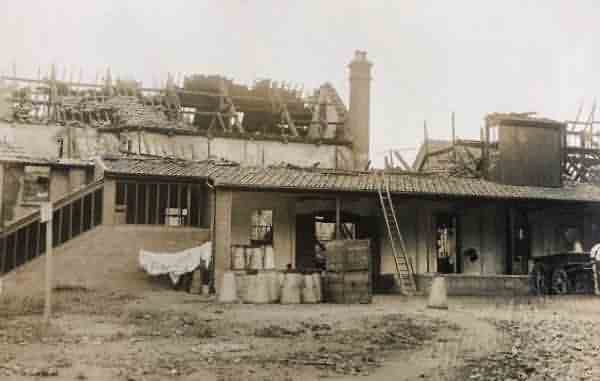 Photograph of the disastrous fire of 11 August 1912. The final estimate for the damage caused amounted to between £15,000 and £20,000 (between £1.5 million and £2 million at today's value). 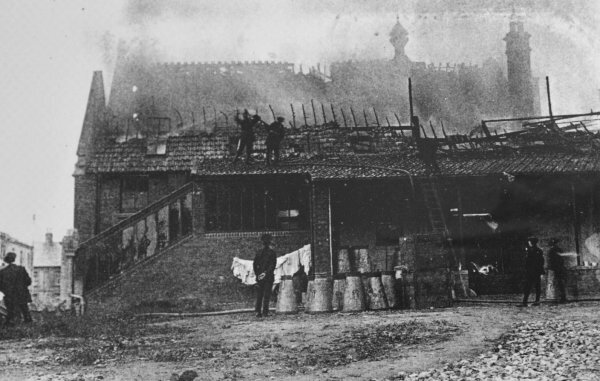 In the photograph of the fire, above, it will be seen that the building at left is identical to the building at right in the early aerial sketch, while the burning building at right in the photograph was clearly a later building constructed in the field at extreme right of the sketch. The fire brigade in attendance - at high level two fire fighters hose down the smouldering building. Another photograph, this reproduced as a postcard, is by Witcomb & Son. The side of the building showing the damage after the fire. Another Witcomb & Son postcard. 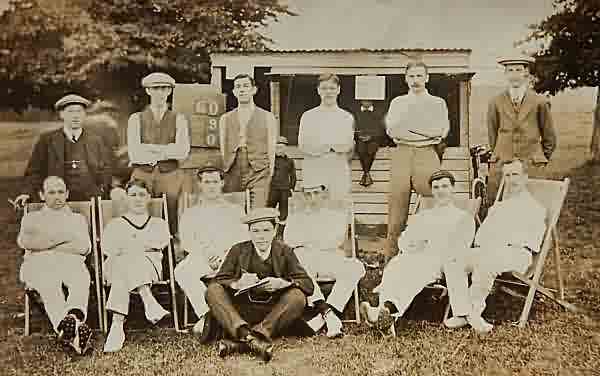 The St Ivel Cricket Club, 1913. 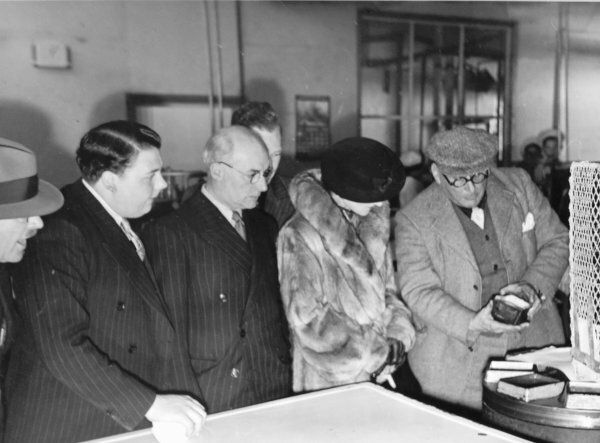 Visitors to the Aplin & Barrett factory inspect the finished product. 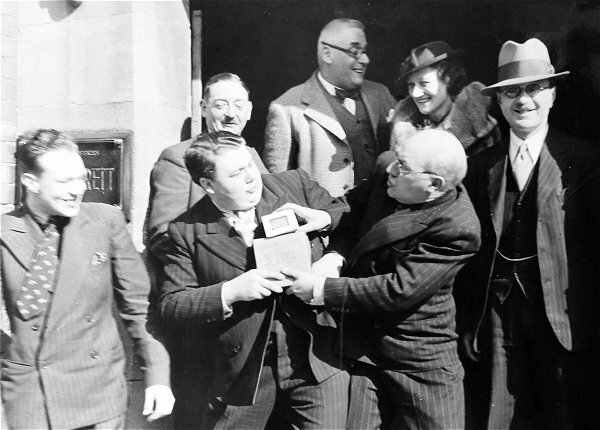 The two men in dark pinstripe suites were British comedy film stars Graham Moffat (left) and Moore Marriott (right) who were in Yeovil in March 1938 to promote the film "Oh! Mr Porter” at the Gaumont Palace. Screen comedians Graham Moffat and Moore Marriott in mock fight over the free samples. At right wearing the hat is Edward Guppy (1873-1954) who rose to become the Company Secretary of Aplin & Barrett. An Aplin & Barrett's letterhead from 1940. Notice that they were contracted to the War Office and the Admiralty to help the war effort. 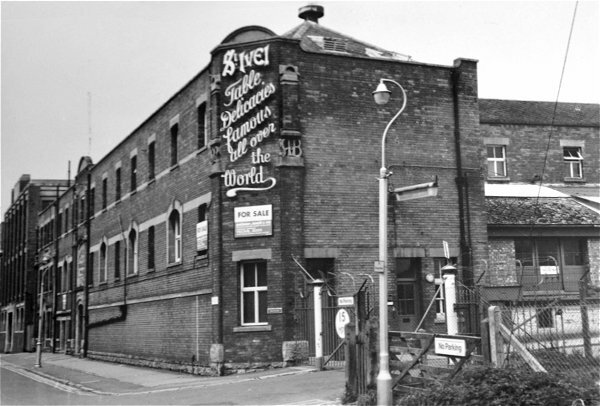 The St Ivel sign on the southern end of the factory - a familiar sight to many Yeovilians. Note the decorative 'AB' monograms on the corner piers. The modernist new building of 1932. 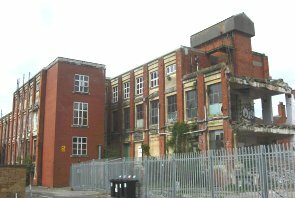 Empty and awaiting demolition in 2013. 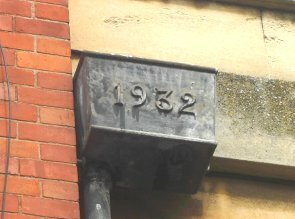 The present building, a modernist edifice in concrete and brick, was built in 1931 and 1932 as witnessed by these dates incorporated into the various rainwater hoppers around the building and shown in the detail photograph in the gallery below. 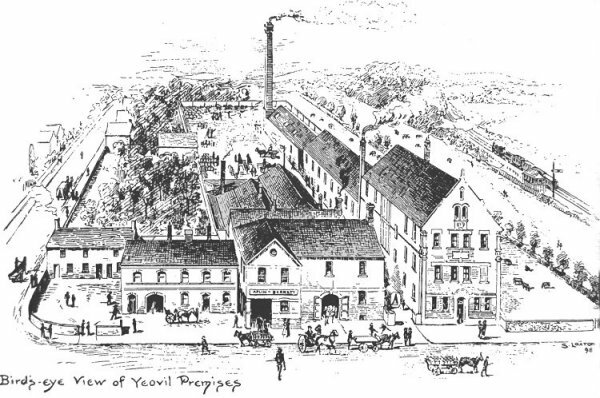 An artist's impression of the Aplin & Barrett factory in the 1950 Yeovil Guide. 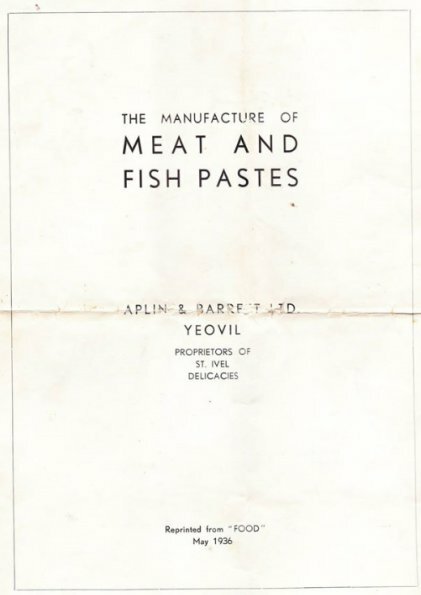 In 1957 Aplin & Barrett produced the first commercial extract of nisin, an antibacterial peptide used during the manufacture of processed cheese, meats, beverages and so forth in order to extend the products’ shelf life. 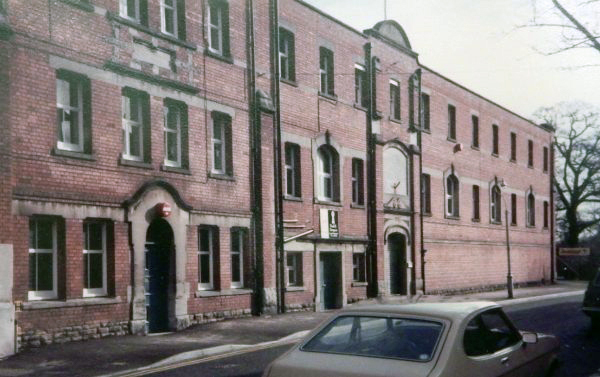 In 1960 the company was acquired by the Unigate Group who closed the Yeovil premises in 1976, transferring many of their staff to other branches, particularly Westbury, Wiltshire. 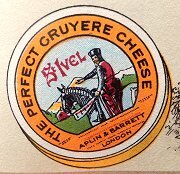 The St Ivel brand, however, continued long after the closure of Aplin & Barrett. 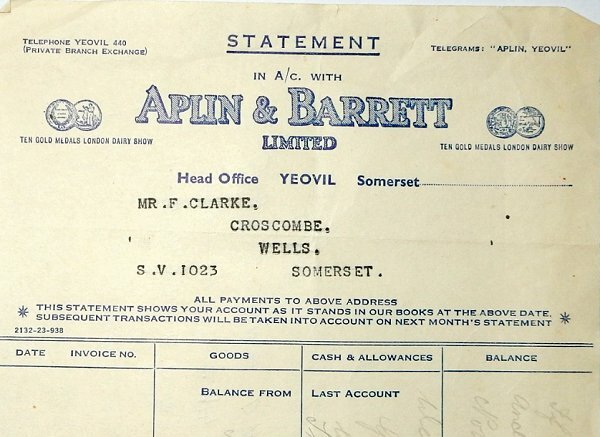 Aplin & Barrett's corporate, accounting and employee records from 1898 to 1961 are held in the Wiltshire & Swindon Records Office. 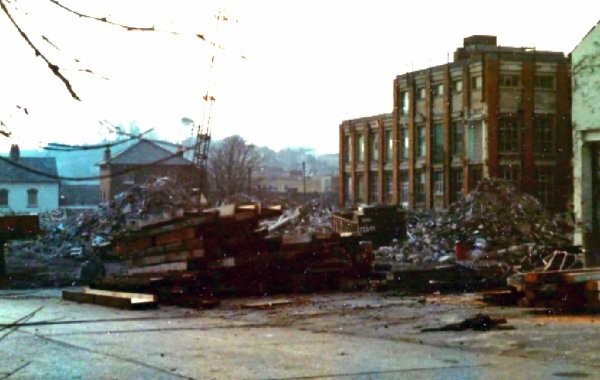 Much of the building was demolished in January 1983, prior to the building of Ivel Court. Map based on the 1901 Ordnance Survey. Aplin & Barrett works shown pink. 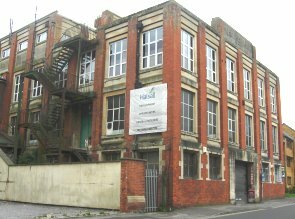 Buildings shaded blue were possibly incorporated into the factory complex but had been sold to the Western Gazette by 1905. 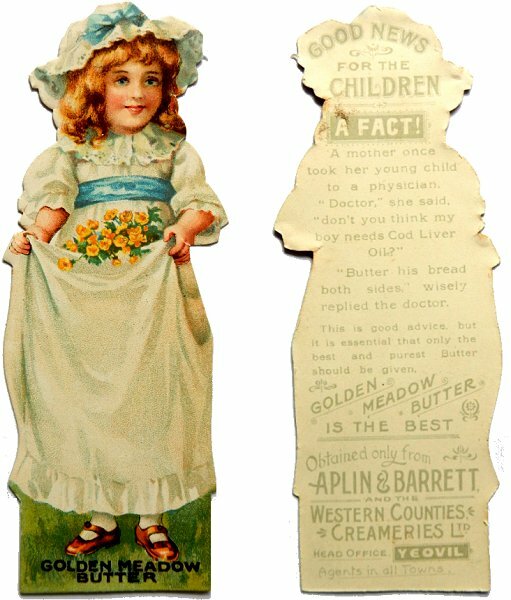 Both sides of a cardboard cut-out advertising bookmark for Aplin & Barrett's "Golden Meadow Butter" from around 1895. 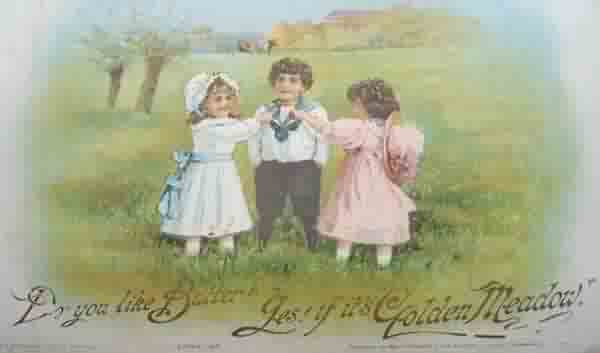 An advertisement of around 1900 for Aplin & Barrett's 'Golden meadow' butter. 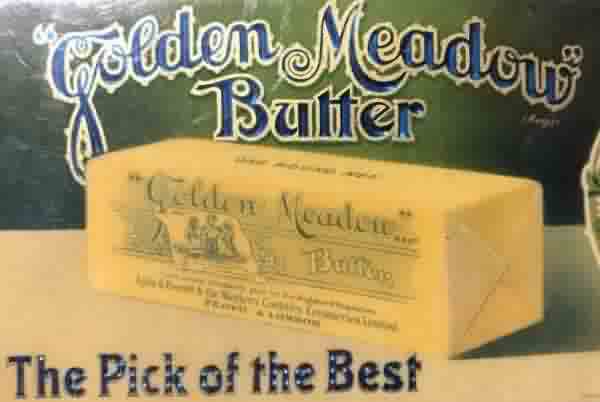 A later advertisement for Golden Meadow butter. 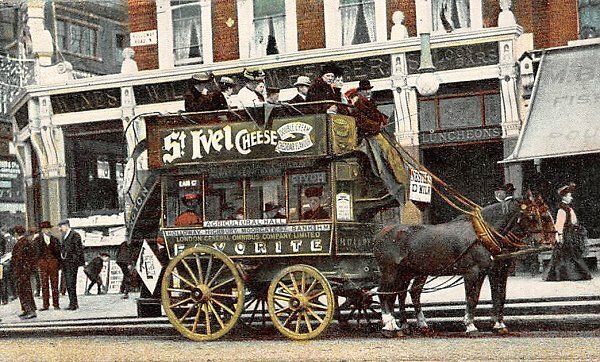 A postcard from around 1900 advertising St Ivel cheese on the side of a London omnibus. An early 'St Ivel' advertisement from a 1903 edition of the London Illustrated News. 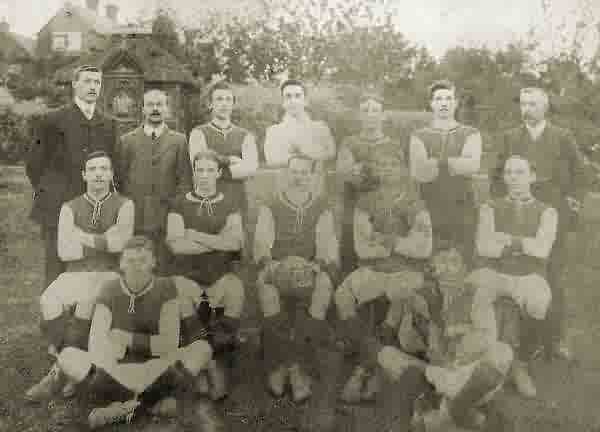 The 1909 'St Ivel' football team. An Aplin & Barrett advertisement from the inter-war years. 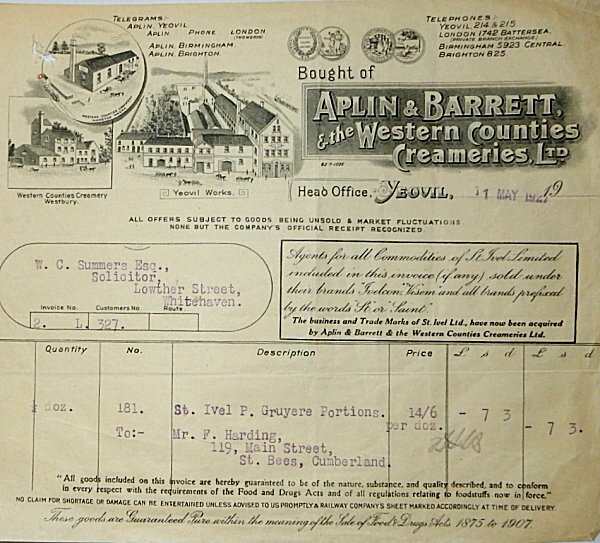 An Aplin & Barrett invoice dated 3 May 1919. A later Aplin & Barrett letterhead style, probably from the 1950s. Aplin & Barrett treacle-glazed stoneware cream jugs and pots. 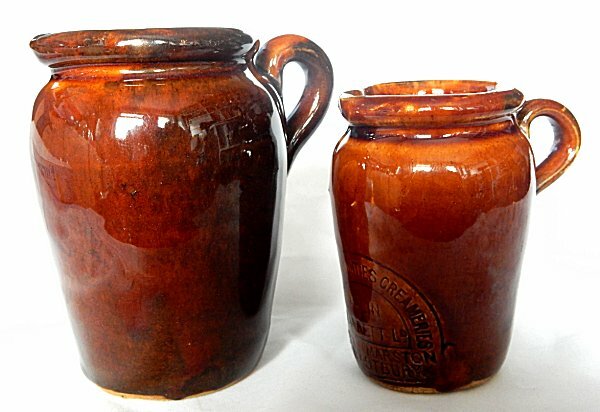 Aplin & Barrett treacle-glazed stoneware cream jugs - each has a pouring lip at the top and a handle. The smaller one is 3" (75mm) high, the larger stands 3¾" (95mm) high. 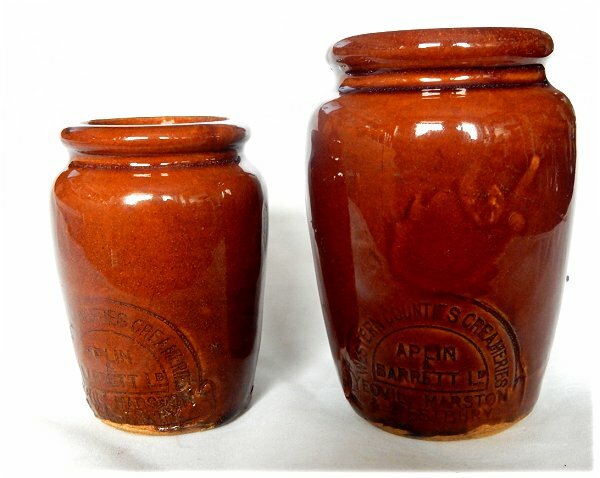 Aplin & Barrett treacle-glazed stoneware cream pots - with a plain, round top and no handle. The smaller one is 3" (75mm) high, the larger stands 3¾" (95mm) high. All the Aplin & Barrett treacle-glazed stoneware cream jugs and pots carried this logo. 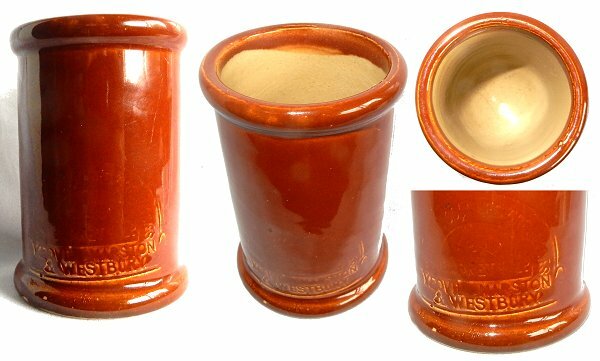 While the cream jugs with handles shown above are relatively common, this cylindrical Aplin & Barrett treacle-glazed stoneware pot is quite rare. It stands 3½" (88mm) high and has a diameter of 2½" (64mm). Sadly the logo is not quite perfect but is the same as the pots above. 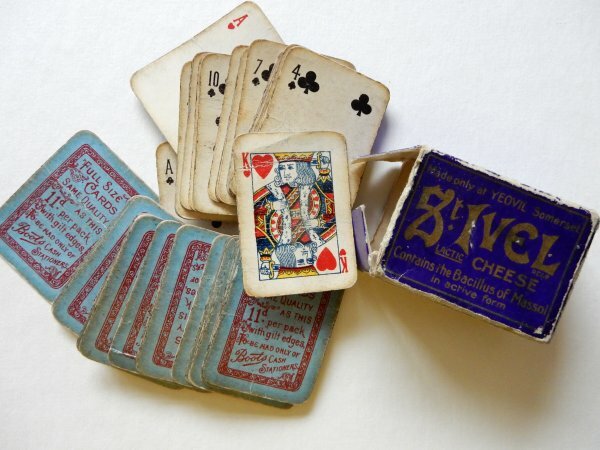 A give-away set of miniature playing cards - made for Boots the Chemists (or in this case Boots the Cash Stationers) and issued by Aplin & Barrett to advertise St Ivel cheese. A complimentary note pad (it's actually made of silver) given away by the company. The reverse of the above complimentary silver note pad. 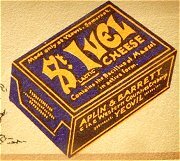 A box containing St Ivel Lactic Cheese. The box, when assembled, measures 4" x 2¾" x 1¼" (100mm x 70mm x 32mm). 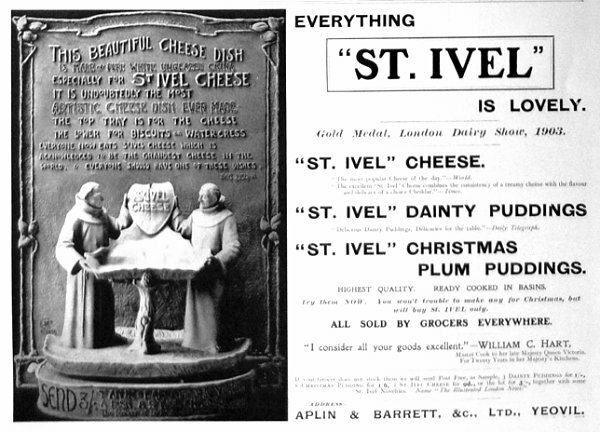 Attractive and original ways of serving St Ivel cheese from the 1920s. 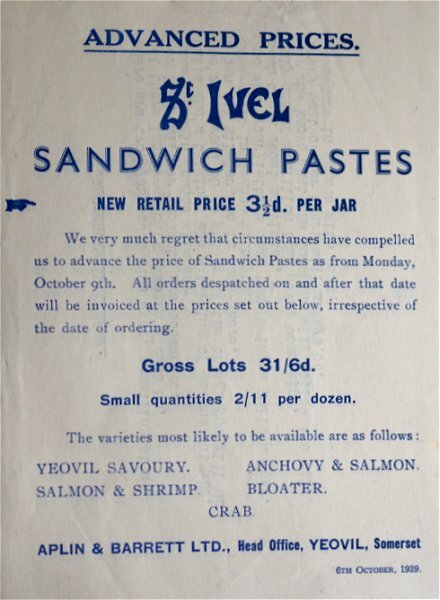 Prices and varieties of sandwich pastes, dated 6 October 1939. One of two Veal & Ham Pie wrappers (from the 1950s ?) 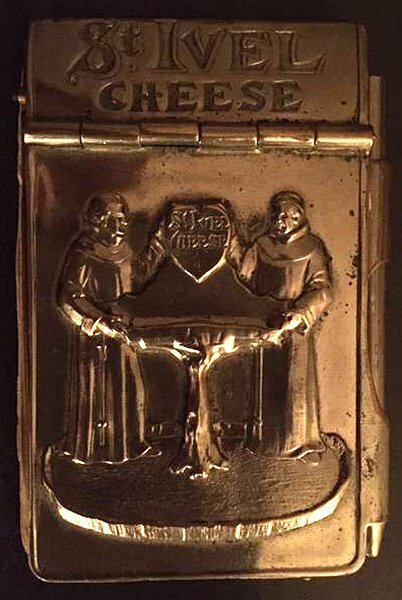 found under floorboards during a house renovation - clearly a builder's lunch. The 'paste shop' where pots of fish or meat paste are filled and packed (see article at bottom of page). Photographed in the 1940s. The lady at centre is Peggy Andrews née Beaton. 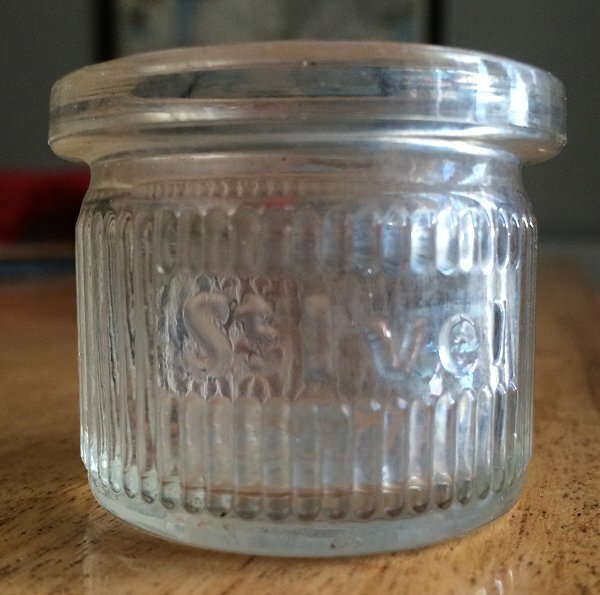 An Aplin & Barrett 'St Ivel' glass pot used for fish or meat pastes and shown in the packing process in the previous photograph. This example was found by Andrew in Accrington, Lancashire, while walking through an area that had previously been an old rubbish tip. Above left is a Christmas advertising from around 1910 - a cardboard bookmark. The prettily posed skater with the product on her lap is selling 'Ivelcon', a beef extract beverage sold in cube form. 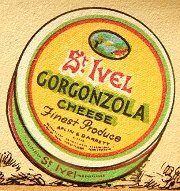 The name of the product combines the name of the brand, 'St Ivel' with the word ‘consommé’. 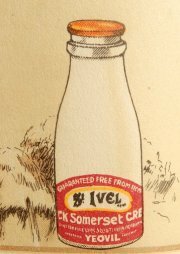 The back of the bookmark describes Ivelcon as “an absolutely pure Food Beverage, containing the concentrated essence of Prime Beef and Fresh Vegetables”. Above right is one of the very first advertisements for 'Ivelcon' from the 21 September 1908 issue of the London Daily News. Promoted as healthy, warming and strength-building drinks or tasty cooking supplements, these products were widely advertised. 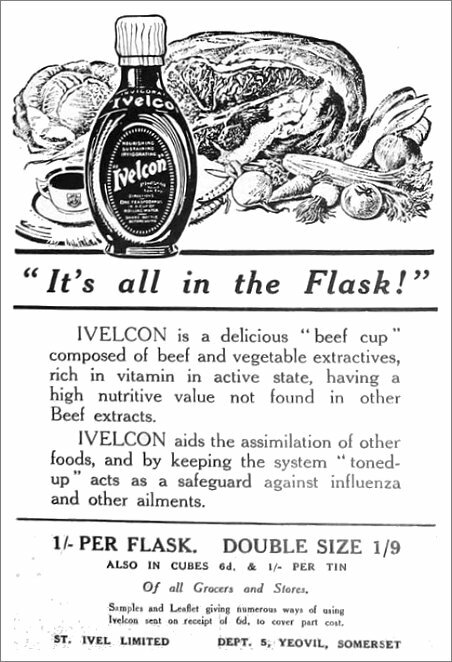 Ivelcon continued to be advertised into the 20th Century. In 1918 an advert in the Illustrated London News promoted the cube’s benefits: “It’s all in the Cube! Drink a cupful of Ivelcon just before going to bed. You will not only find it sufficient as a light meal to carry you over until the morning, but it will bring refreshing sleep”. Above left is a brown glass 'Ivelcon' bottle from the 1920s, shown slightly larger than lifesize - it measures 4.25" (107mm) tall and 2" (50mm) across. 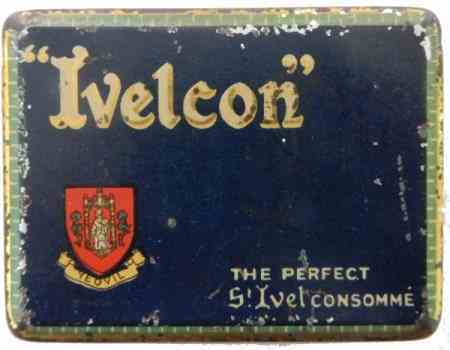 The word 'Ivelcon' is embossed very lightly across the shoulder of the bottle. 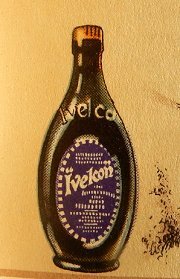 Before the Great War, when the product was comparatively new, Aplin & Barrett's advertisers worked a scheme of house-to-house sampling of their Ivelcon beef extract beverage, with demonstrations. The canvasser asked for hot water and prepared a sample cup if Ivelcon beef-tea for the householder in anticipation of a sales order. A small tin (2¾" x 2" x ¾" - 65mm x 50mm x 20mm) that held twelve individual portions of 'Ivelcon' beef consommé. This was almost certainly sent to troops serving in the Great War. 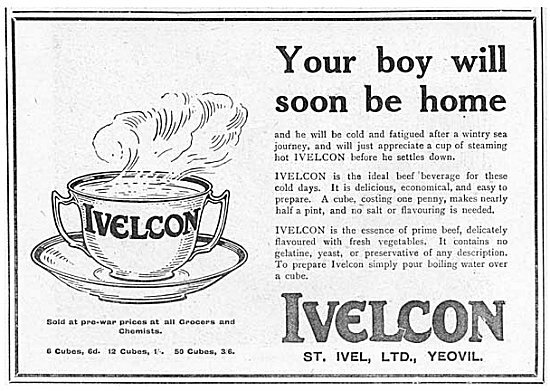 An Ivelcon advertisement from 1918. 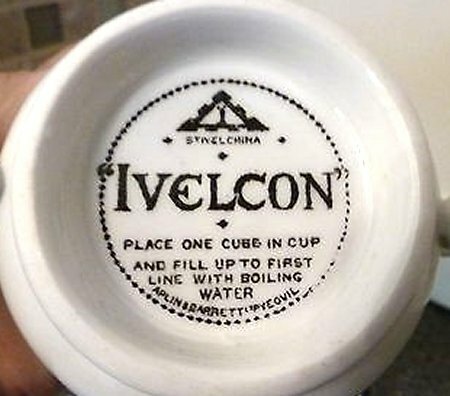 Note the specially-designed Ivelcon cup (see below). Other advertisements of the time noted "A Perfect 'Beef-Cup' for One Penny. Made in a Moment". 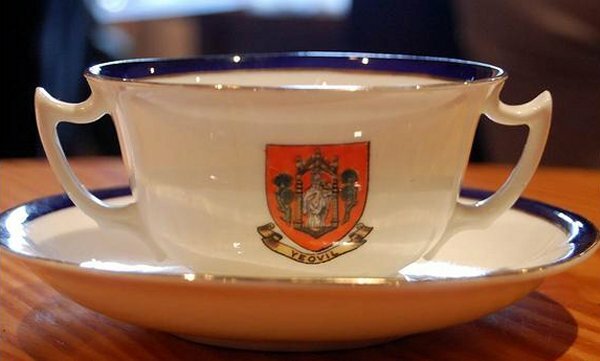 This is a specially designed promotional cup and saucer to promote Aplin & Barrett's 'Ivelcon' meat extract between 1908 and 1925. The cup measures 4.25" across and the saucer is 6" in diameter. .... and on the bottom of the cup were complete instructions. 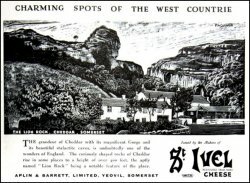 In the 1920s Aplin & Barrett published this book of tours of the West Country - each page featured a small advertisement (see below) for one of their products. 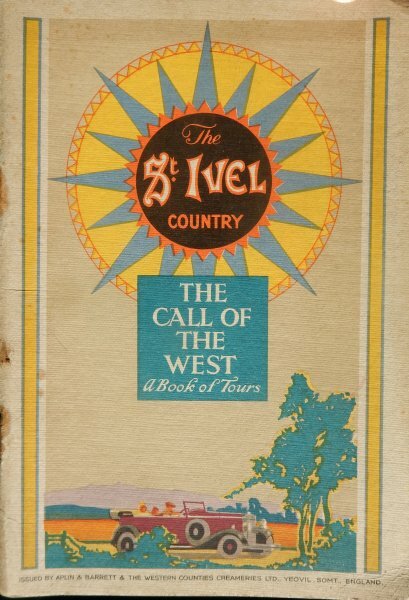 Product advertisements from the pages of the 1930's 'The Call of the West' tour guide, above. All are enlarged from the original size. 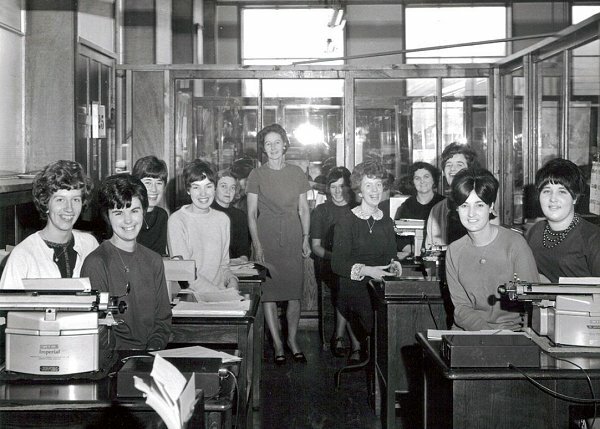 The Aplin & Barrett typing pool, photographed in the late 1960s. 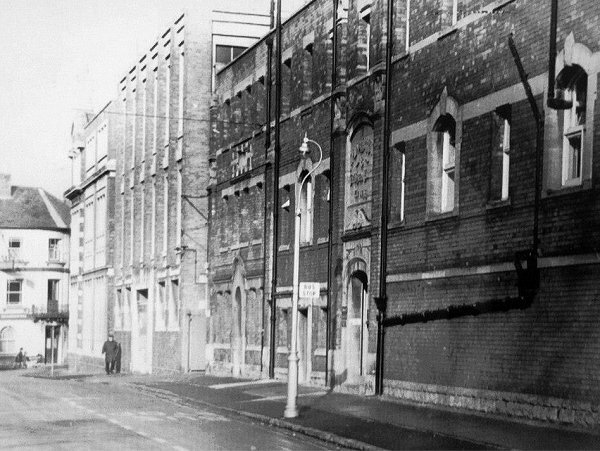 Aplin & Barrett's Newton Road elevation photographed in 1969 before the demolition of the right-hand building. The front of the now-empty building. 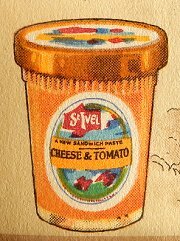 1954 Advertisement for St Ivel. The date cast into the rainwater hopper. 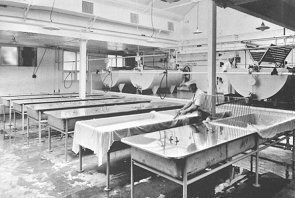 The cheese-making room, circa 1960. 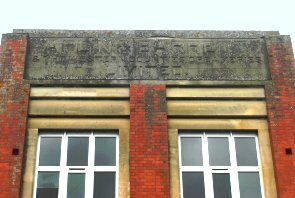 The Aplin & Barrett sign in concrete. The building from Summerhouse Hill. 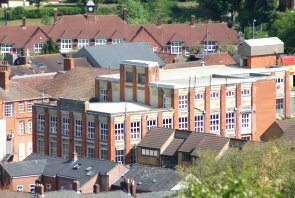 The building from Wyndham Hill. 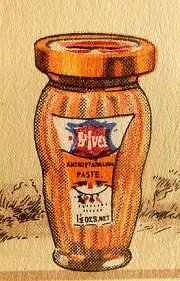 An advertisement of 1928 for Aplin & Barrett's 'St Ivel' brand products. 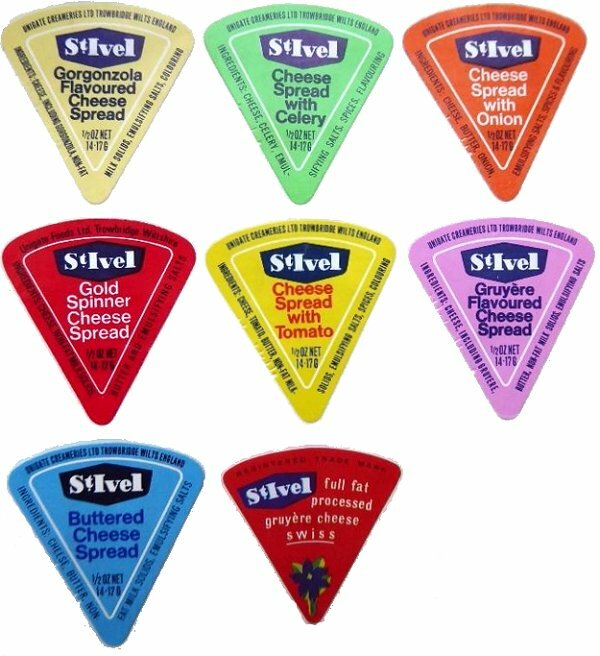 .... and more recently - labels from various flavoured cheese spreads. 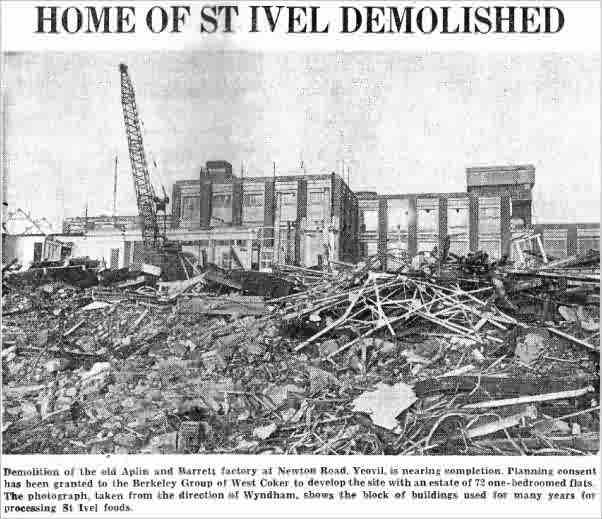 The St Ivel brand was retained by Unigate after the acquisition of Aplin & Barrett In 1960 and after the closure of the Yeovil premises in 1976. A photograph of Aplin & Barrett's stand at the Yeovil Show, held at Barwick Park. Photographed during the 1950s. 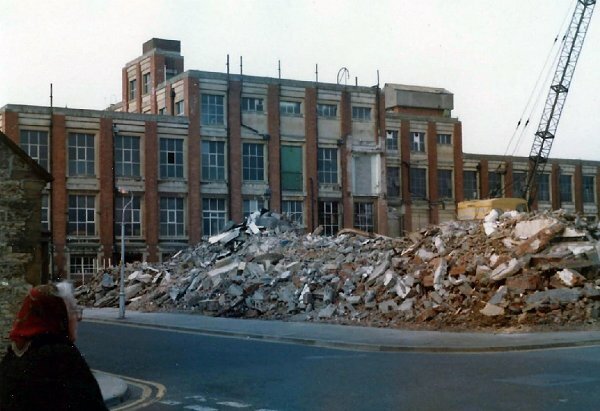 The Newton Road face of Aplin & Barrett shortly before demolition began in 1983, prior to building Ivel Court. A photo and caption from the 21 January 1983 edition of the Western Gazette. 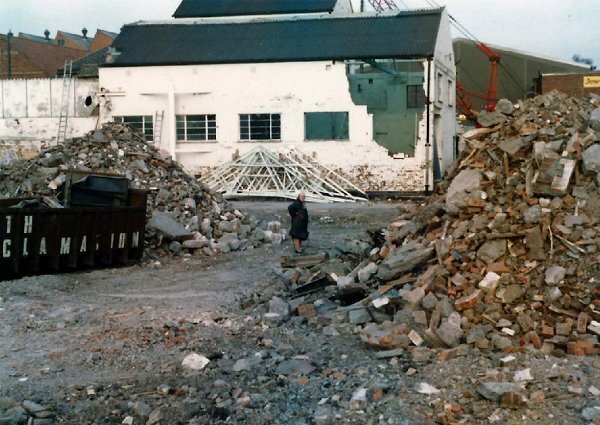 The following photographs are courtesy of Rob Baker and show the demolition of part of the factory prior to the building of Ivel Court on the site. 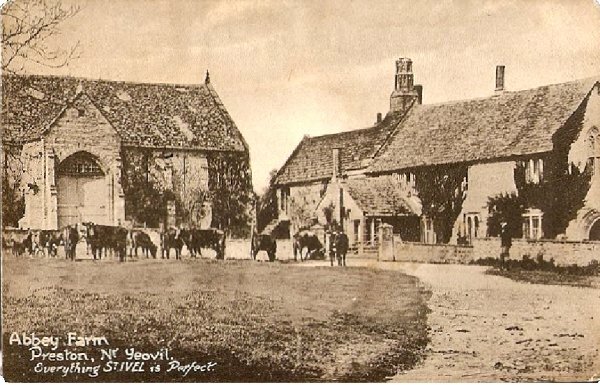 The following was a series of 12 postcards entitled "Series 1 - Beautiful Old Homes near Yeovil" produced around 1905. Each carried the slogan "Everything St IVEL is Perfect". 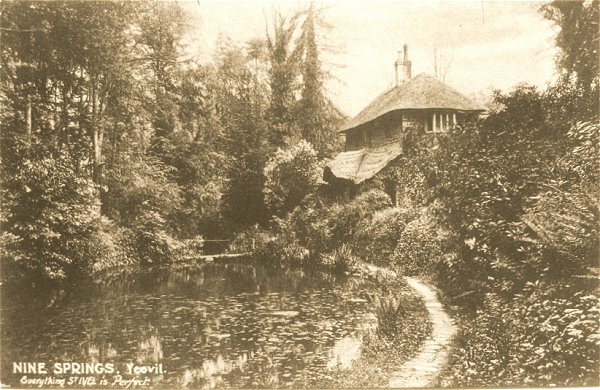 The cottage at Ninesprings - this example posted in 1914. 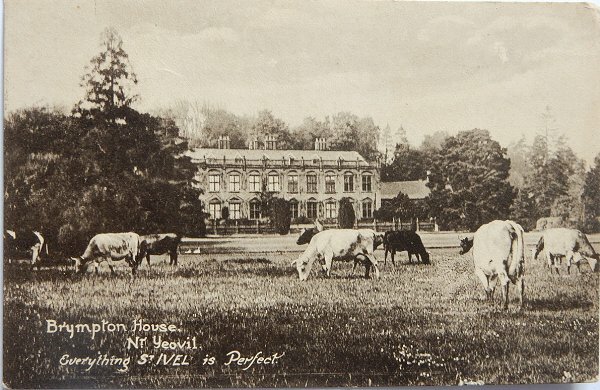 A postcard of Newton House with the River Yeo in the foreground. 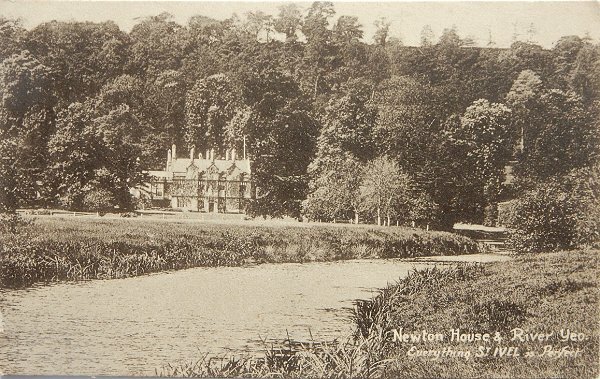 Another postcard of Newton House and the River Yeo. Another postcard in the series, this time of Preston Great Farm colloquially (and incorrectly) known as Abbey Farm. 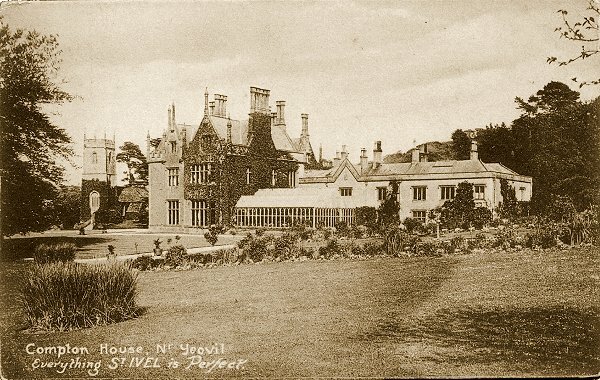 Another postcard in the series showing Barwick House. 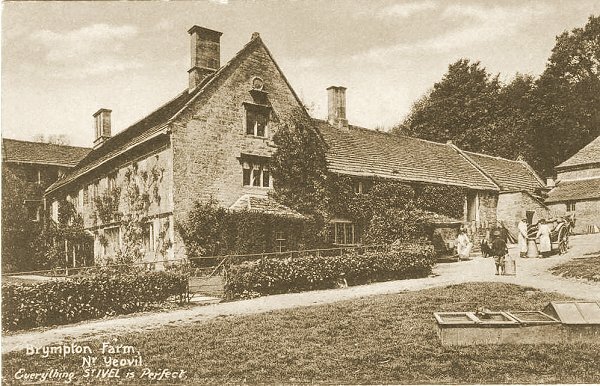 Another postcard of 'Abbey Farm' from the Aplin & Barrett's St Ivel series - but this time it's Abbey Farm in Montacute.. 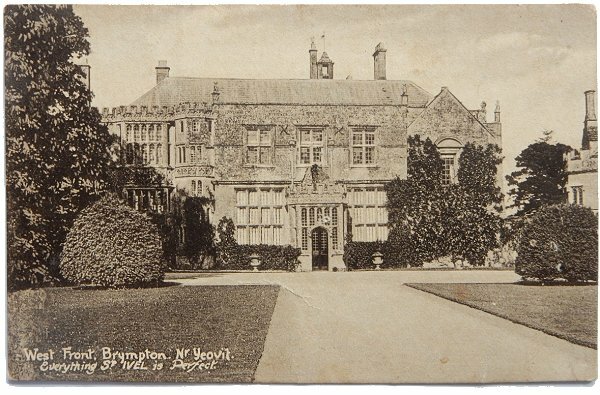 The first of two postcards in the series featuring Brympton House. 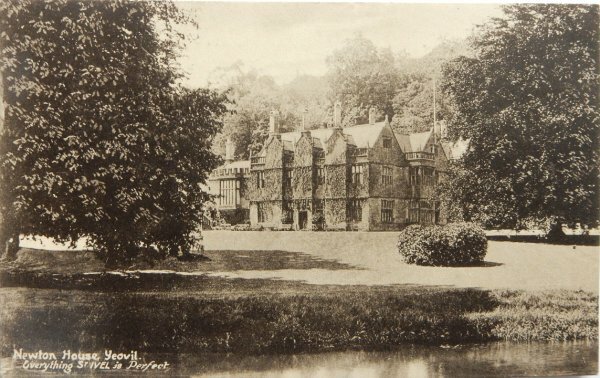 .... and the second postcard featuring Brympton House. .... and one featuring Brympton Farm. 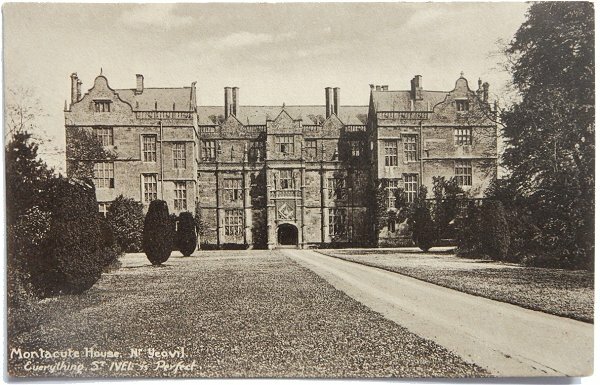 Moving out of Yeovil completely, this postcard features Montacute House. 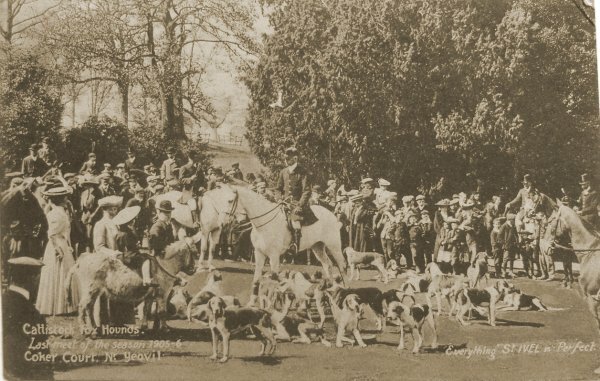 This final postcard of the series features the Cattistock Hunt and is captioned "Cattistock Fox Hounds. Last hunt of the season 1905-6. 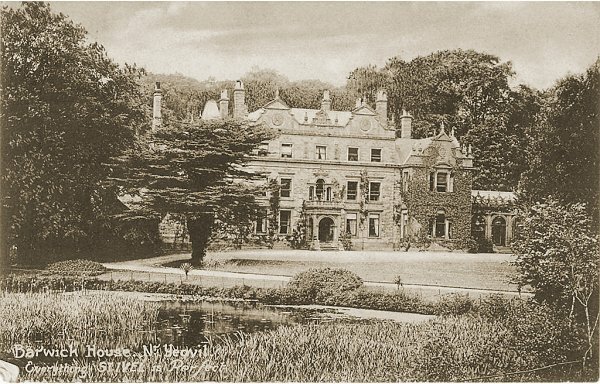 Coker Court, nr Yeovil". This postcard was sent in 1907. The following is from an article from 'Food' magazine of May 1936 and was reproduced as a separate publication by Aplin & Barrett. 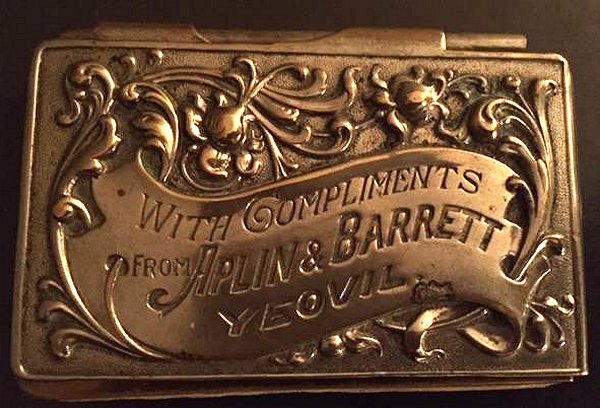 The firm of Aplin & Barrett Limited was founded in 1897 on the pre-existing partnership of Mr Shorland Aplin and Mr WH Barrett. 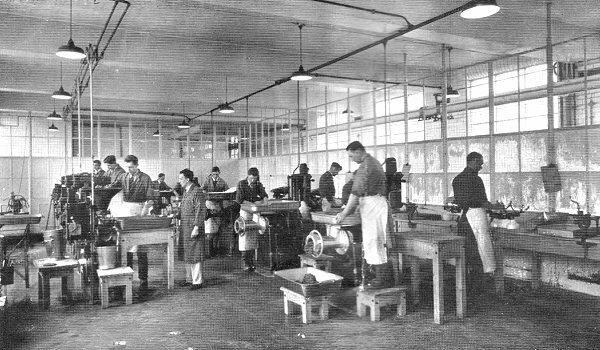 The headquarters and main factory are still situated at Yeovil in Somerset but continued expansion has necessitated additional factories at London, Westbury (Wilts) and Frome. 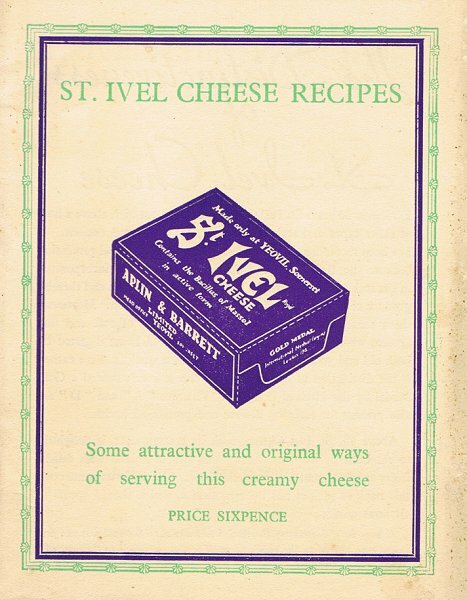 The foodstuffs manufactured by this firm embrace the wide range if St Ivel products, well-known examples of which include various types of cheese such as lactic, cream, crustless and Camembert; a large variety of sandwich spreads, for example meat pastes, fish pastes, tongues, briskets, galantines, brawn and sausages; and miscellaneous products among which are cream, butter, honey, lemon curd, Christmas puddings, mincemeat, savouries and soups. 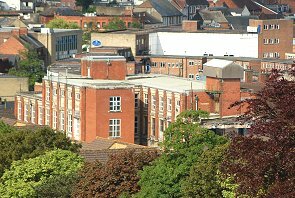 The parent works, at Yeovil, comprise two main buildings occupying about three acres. In one are housed the departments dealing with dairy products; the other is used almost exclusively for meat products. It was this latter building which we visited for the purpose of this article. This building was erected only three years ago and is consequently arranged and equipped in accordance with modern ideas. It has a frontage of 64 feet and a depth of 240 feet and consists of four floors. Special care has been given to all features contributing to a high standard of hygiene and cleanliness. The entire building is faced internally with white glazed bricks. The rooms are lofty and spacious and all corners are rounded. The floors are concrete and admirably drained. The windows are large and are constructed of prismatic glass to ensure even lighting. The whole building is under air pressure, the air being drawn in at the roof, filtered, and forced into the building along one side at a height a little above the level of each floor. On the opposite side of each floor it is extracted at ceiling level, and in this manner the air is exchanged every fifteen minutes. Each floor is equipped with basins and sinks for cleaning utensils and for use of the employees. Equipment which comes into contact with food is sterilised by steam. On each floor a passage running the length of the building is fitted with the Morris conveyor system. The raw materials are brought from cold storage to the preparing room. All fish and meats are carefully scrutinised by a staff of highly skilled examiners whose capacity for assessing the quality of these materials is quite uncanny. 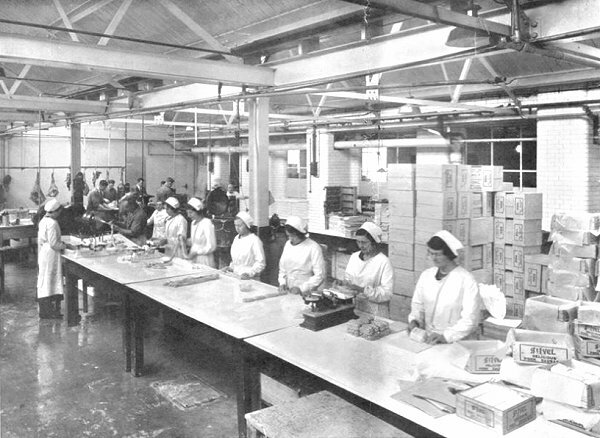 The ingredients are weighed out and passed twice through Alexander mincers (William Douglas & Sons Ltd) and then through Premier mills. 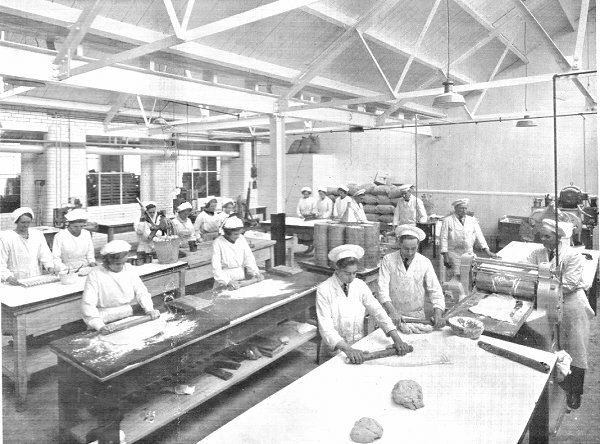 The preparing room, where raw materials are weighed out, passed twice through mincing machines and through a battery of Premier mills (on the left). The paste passes to the filling room where it is charged into Jackson fillers (the recent and improved models of this filler are now made by Jackson Crockett & Co Ltd) from which the glasses are filled by a girl at one end of a stainless steel table equipped with a travelling belt. Succeeding girls level off the paste, wipe the rim of the glasses, insert the parchment circles, place on the rings and caps, seam on the caps by aid of a Wallis capper, and finally deposit the pots in wire baskets together with metal labels giving the batch numbers. The filling room. 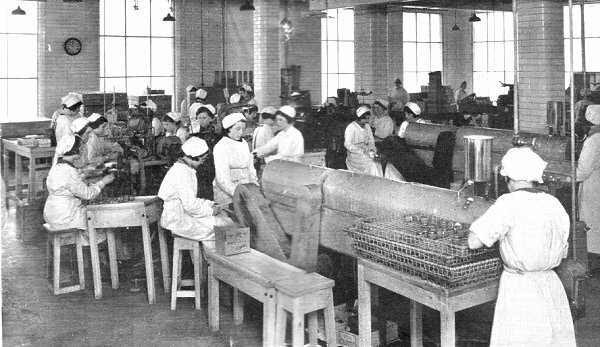 Girls are seen filling the paste into glasses, preparing the tops in several stages, and seaming the caps. Finally, the pots pass to the girls on the right, who place them in wire baskets. It is interesting to note the care taken to ensure cleanliness of the glass containers. They are unpacked in an out-house so as to keep and foreign matter out of the factory. The pots are brought into the washing room in wire baskets, each pot being placed in an inverted position. They are then passed through a Worssam washing machine and on emerging are again placed mouth downwards in wire baskets ready for passing to the paste filling machines. This photograph shows the two machines for cleaning the glasses, seen emerging clean and dry to be placed upside down in wire baskets. The baskets of pots are conveyed to the retort room by means of a Morris runway. In many factories the condition of the retort room is a little disappointing. Not always is proper attention given to the removal of steam from the premises. In this instance a duct for extraction of the steam had been placed above the retorts and a Sirocco fan discharges the steam into the outer air. The concrete floor is in good condition and free from excessive moisture. A battery of horizontal Milne and Waller retorts has been installed and fitted with instruments (Cambridge) for full thermostatic control. From each retort samples are taken from six different points and sent to the laboratory for bacterial examination. This view is the retort room. 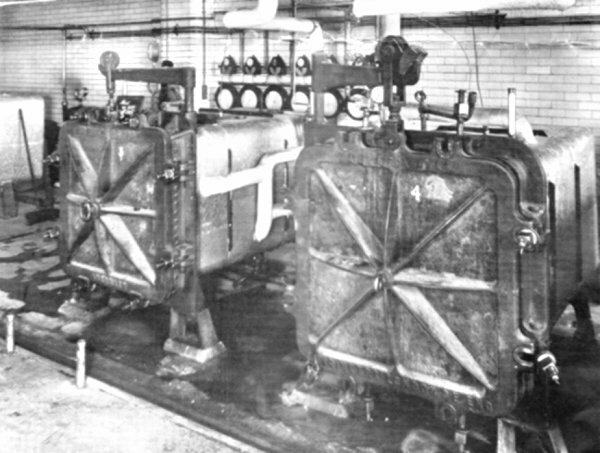 Two horizontal retorts are shown with thermostatic control instruments behind. 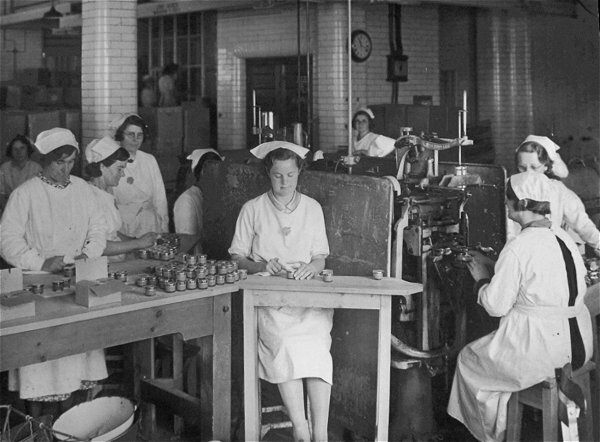 After sterilisation the pots are taken from the retort room and sent to the labelling room where they are passed through a Worssam washer, then dried and polished. After this they are labelled (Purdy machines) and the labels subsequently wiped to remove any surplus gum. A batch number is put on each pot. The pots are now packed into corrugated boxes, each holding two dozen, together with a display carton. The boxes are taped, and both variety and batch labels are affixed on the outside. The boxes are stacked on boards and taken by lifting trucks down the lift to the stock room. Labelling Room. Pots of paste passed through washers (right) and labelled (left), after drying and polishing (see an example of a paste pot above). Here they must remain for three or four days until they are passed by the laboratory as sterile, after which they are ready for dispatch. An important part of the routine work of the laboratory is to apply bacterial tests to all processed goods before they are allowed to leave the factory. The other part of its routine work is to subject all incoming raw materials to chemical examination. In addition to this, the laboratory is constantly engaged upon research work aimed at effecting any possible improvements in the processes and also the products. Other duties comprise the control of temperatures and times of retorting operations and the checking of the sterility and general cleanliness of the plant and equipment used throughout the factory. Here the meat is prepared for the sausage, pie and small goods departments. The meat is boned in the usual manner, and then passed through the Silent cutter. 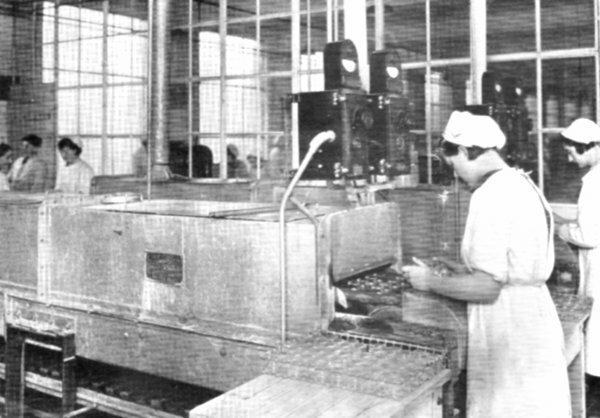 The flour, lard, salt and other ingredients used for preparation of the pie pastry are weighed into a Baker Perkins dough mixer. The dough for the shell of the pie goes through a Baker Perkins divider and thence to a Jackson pie moulding machine adjustable to any required size. The dough for the lids is run through a Baker Perkins pastry brake and thence to a Jackson lidding machine. Weighed amounts of the meat and eggs are then filled into the pie shells, the lids placed on and painted with egg yolk. Baking is done in a Baker Perkins bank of coke fired ovens. On emergence, the pies are tipped out of the tins and placed on wire trays which are conveyed through a cooling tunnel. On reaching the delivery end, after a period of about twenty minutes, additional jelly is injected into the pies to make up for losses during boiling. The pies are then placed in a series of cooling lockers where they remain until they have become quite cold at their centres. Finally the pies are packed into individual window cartons, which then go into wooden outers for dispatch. The pie room, with the dough mixer and pastry-brake on right. The meat received from the butcher's room is passed first through a Silent cutter, then through an Alexander mincer and finally through a Baker Perkins mixer. The sausage meat is filled into casings in the usual way, then wiped, weighed and boxed. 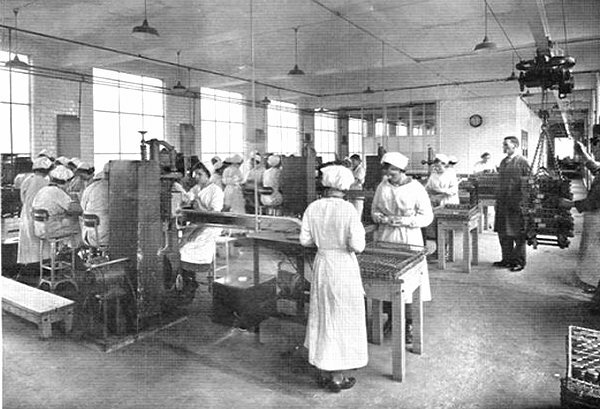 The sausage room, showing filling operations (left), followed by linking, weighing and boxing. In conclusion we wish to thank the directors of Aplin and Barrett Ltd for permission to visit their works and obtain the information for this article.